Used for pain relief. 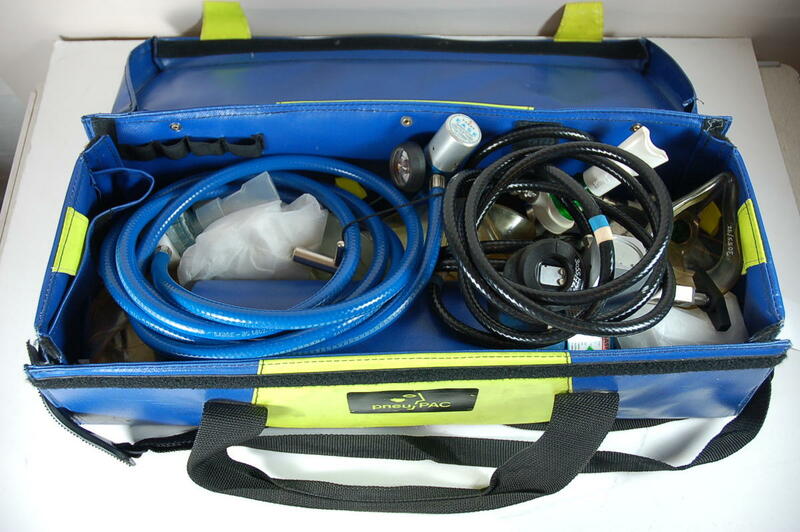 Blue coated canvas bag, with two yellow squares on the centre of the front and back panels containing the "PNEU PAC" logo. A nylon strap handle attaches to either end of the bag, detachable via clip at proper right. The bag also has two loop handles attached to the front and back panels of the bag. The lid is hinged at the back panel and Velcro strips seal it shut. Front and back panels pull down to open the bag out and are sealed back into place with Velcro strips. Contents include an empty Oxygen cylinder, two adult and three child high concentration oxygen masks. Two mouth pieces, one in a clear bag, two delivery pipes/demand valves and one "D" sized cylinder (empty), and one red clip.